As you can see from my previous beauty posts (specifically, here and here) I am not loyal to any one brand. To me beauty is something that should be fun and there’s nothing more exciting than testing new brands and trying out the latest products. Of course this habit could get pretty pricey so the key is to stick to the drugstore brands when your experimenting with new formulas. (For the higher end products, consider one of the sample subscriptions to discover new products without the commitment and cost. Christine and I both subscribe to Birchbox!) These three products are the latest additions to my vanity. With this new foundation (yes, i know we all hate that word) the name really says it all. I’m a huge proponent of the no-makeup makeup and this lovely liquid is perfection. It’s got the coverage of tinted moisturizer without the extra hydration. For an oily faced girl like me that’s the key. Sheer coverage, hold the shine. I can just apply with my fingers and it blends right in. The thing I like best about this product is it honestly does look like my skin. Most sheer formulas I’ve tried (Maybelline Fit Me comes to mind) have a kind of blurry finish which is just as obvious as heavier foundation when you have freckles like me. Revlon Nearly Naked lets my freckles show through and somehow still evens out my complexion for a totally natural look. As an added bonus, there’s a wider shade range than I expected; I use Vanilla for my light skin tone. I really do love my hair. I know it’s a crazy thing for a woman to say, but really I just enjoy playing with different styles. I have a few go to root lifting products but I was curious about this alcohol-fee formula from L’Oreal. I have to say I was impressed! My hair’s not stiff or sticky and it give me just enough oomph for everyday. I also noticed that without the alcohol my hair looks more vibrant and shiny. Both pluses in my book! You already know from my Lip Service post that I’m obsessed with lip products. The thing I’ve noticed about tinted balms is that they lack any real moisture. 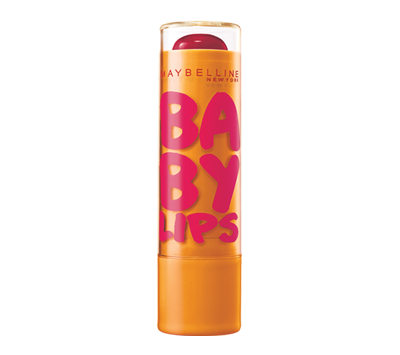 Not the case with Baby Lips! I’m amazed by how soft and smooth my lips feel. I love the Cherry Me shade for a bit of a pinky red stain. Looks like a just ate a popsicle. Yum!